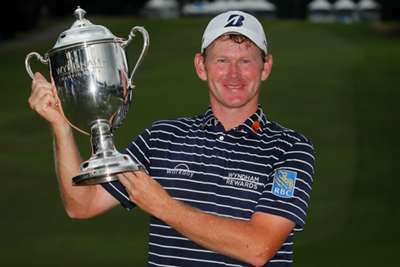 Brandt Snedeker was unstoppable at the Wyndham Championship as he won his first PGA Tour title since 2016. Snedeker ended his Tour drought with a three-stroke victory at the Sedgefield Country Club in Greensboro, North Carolina on Sunday. The American earned his first Tour win at Wyndham 11 years ago, and now he up his ninth career victory following his final-round five-under-par 65. Snedeker beat Webb Simpson (62) and C.T. Pan (66) by topping the leaderboard at 21 under, which was sealed with a birdie on the par-four 18th hole. "I guess I'm turning into Bubba Watson, wanting to cry every two seconds out here," Snedeker joked after his win. ""You know, it being my first tour win and having Wyndham believe in me in 2007 when I was a 26-year-old kid and being my longest term corporate sponsor out here ... Everyone has done a great job to make me feel like I'm a part of the family. "So to do it here, to shoot 59 on Thursday, to be in the lead all week and deal with that pressure every night, to be able to step up to the plate today and shoot a 65 when I had to, it means the world to me." On Thursday, Snedeker opened the last tournament before the FedEx Cup play-offs by making history with a sub-60 round. Snedeker – who is projected to jump up to 30th in the FedEx Cup standings – became only the ninth player in Tour history to score a round that low, and easily claimed top spot with his 11-under 59. Jim Furyk (63) and D.A. Points (67) finished four shots behind Snedeker, while Ryan Moore (67) and Brian Gay (69) were a stroke further back.